AD12: The Vending Machines burgler-proof Adimac's range. Projected to resist to any form of anti-social behaviour, AD12 is ADIMAC anti-vandalism snack vending machine for public places. This revolutionary machine has been developed to guarantee an experience of functional Vending, without risks. The AD12 aesthetic is completed by an user-friendly interface and by a frontal showcase which allows all products maximum exposure. 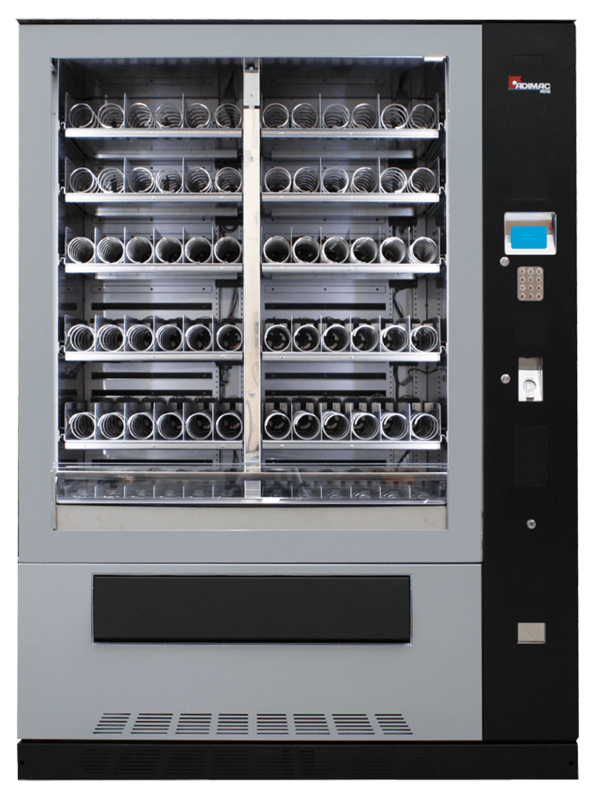 Finally, the innovative trays expand the vending machine performance allowing a more profitable and efficient sales management and it helps the staff during the loading. Two vending machines in a single unit. Using two independent sections with a maximum of 7 trays each, you can insert as much as 84 different products. AD12 innovative refrigeration divided in two independent sections, which allows to have four different temperatures thanks to the ventilation system. Extractable air filter for easier maintenance. AD12 may have a patented elevator accompanying the products at the same level of the collection compartment, avoiding fall damages and allowing the sale of fragile products. Thanks to the frontal doorway “flag” opening it’s possible to extract the fridge group. Pull-down lock, designed by Adimac, one-of-a-kind to make easier the machine opening. The two sections are independent, also the trays configuration and height are independent. A flexible configuration for each tray is possible. It allows you to insert any typology of product. AD12 has stainless steel sensitive points in order to make it even stronger, also for installations in dangerous places. Many accessories are available in order to make AD12 more resistant against vandalism acts. An optimized depht to avoid placement problems in any position. Thanks to a revolutionary refrigerator system the machine can be leaned to the back wall using our system of anterior additional ventilation.